My family and I were so happy to finally take some time out of our busy schedules to sit down and watch The Promise: The Birth of the Messiah. Glorious Films did an amazing job creating this animated musical. My children and I just love the theater and musicals, and we found this movie very entertaining. My 10 yr old son said that he really liked the music. I LOVED that the words to the songs are words from the Book. They were singing scripture...what a great way for kids to memorize the miraculous birth of Jesus Christ. They really bring this Bible story to life. The Promise was very high quality animation. Up to par with any of the other Hollywood animation studios for sure. I asked my kids what their favorite part of the movie was, and they all said "When Baby Jesus was born!" My 6 year old told me that she didn't like when Mary's mom didn't believe her. That made for a great conversation for my daughter and I. I'm sure we will all have that moment or moments in life when God is directing us down a certain path or telling us to do something, and there will be people who'll be negative or think we're crazy. We still have to trust God in everything. I had a few favorite parts myself. The love story between Mary and Joseph was so beautiful! The story of Elizabeth and Zechariah was another favorite. They are characters that we can relate to. Elizabeth and Zechariah remind me of some of my family members. When the angels appeared before the shepherds...aaahhh! I loved that part too! 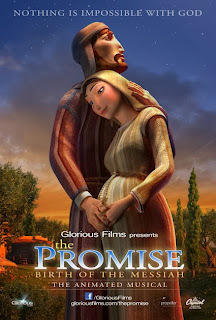 This is such a great movie to remind us the reason for the season. Christmas-sy per say. This would be a great stocking stuffer, or a gift to open on Christmas Eve to watch before Christmas. You can purchase this wonderful movie on Amazon.com.